It is rumored that Facebook was going to call the like button “awesome.” But they didn’t. That is a good thing because the word awesome is over used already. It is often trotted out to try and make the ordinary a little more extraordinary. You may also have noticed I used it in the “headline.” But I couldn’t help myself. That is maybe one time too many. In the interests of scientific advertising, I thought it may have caught your attention. So to keep up the experimental data research project that is digital marketing, ROI measurement and headline optimization, I slipped it in. So back to Facebook. Facebook was the first social media network I joined in 2008 and at the time there were about 50 million users but growing rapidly. This seeming fad at the time was not seen as anything but a passing phase. How wrong were those dinner party discussions. Today there are nearly 1.4 billion users that are spread all around the world. It connects different cultures and allows us to share with family and friends in real time. The USA and Canada is now just a sub-set of the Facebook global family. Europe has another 301 million. In the Facebook ecosystem there are apps and apps. From messaging apps including WhatsApp and Messenger, to visual apps like Instagram and even Occulus. Occulus is the virtual reality technology that Facebook bought for $2 billion just over 12 months ago. Their number are also large by any measure. These three are still to be monetized with ads and the potential earnings of this Facebook ecosystem is staggering with $12.47 billion revenue alone just from Facebook in 2014. So watch that space over the next 5-10 years. How can you use the Facebook ecosystem for your business? Facebook advertising campaigns and contests are one way to tap into the platform to grow your fan base, email list and clients and revenue for your business. If you want to learn how to do that, join me for a “Free live webinar”, where you will learn the best practices and tactics for running a successful Facebook campaign. Here are some fascinating numbers on a range of Facebook facts and metrics from mobile, revenue and a host of other facts to share in your presentations and wow your next dinner party guests. Every second there are 20,000 people on Facebook. 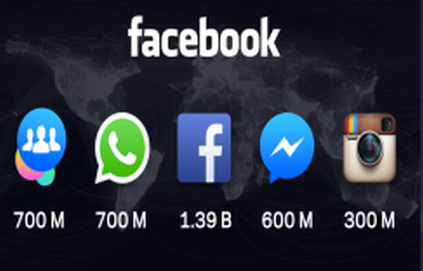 This means in just 18 minutes there are 11 million users on Facebook. 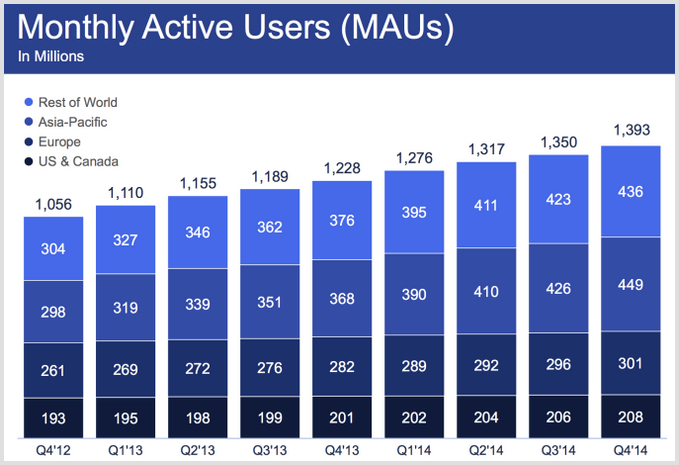 On average there are 486,183 users a minute accessing Facebook from their mobile. 79% of all users are accessing Facebook from their mobile. There are 745 million daily mobile users. Facebook is adding 7,246 people every 15 minutes or 8 per second. Every minute there are 150,000 messages sent. Every 15 minutes there are over 49 million posts. To be precise 49,433,000 or 3 million posts per minute. There are 100,000 friend requests every 10 minutes. There are 500,000 Facebook “likes” every minute. Nearly 69% of Facebook’s ad revenue comes from mobile advertising. Facebook earns $2.5 billion a quarter from mobile advertising. People share 1.3 million pieces of content on Facebook every minute of every day. In November of 2014the number of video uploads to Facebook exceeded YouTube video uploads according to Social Bakers. 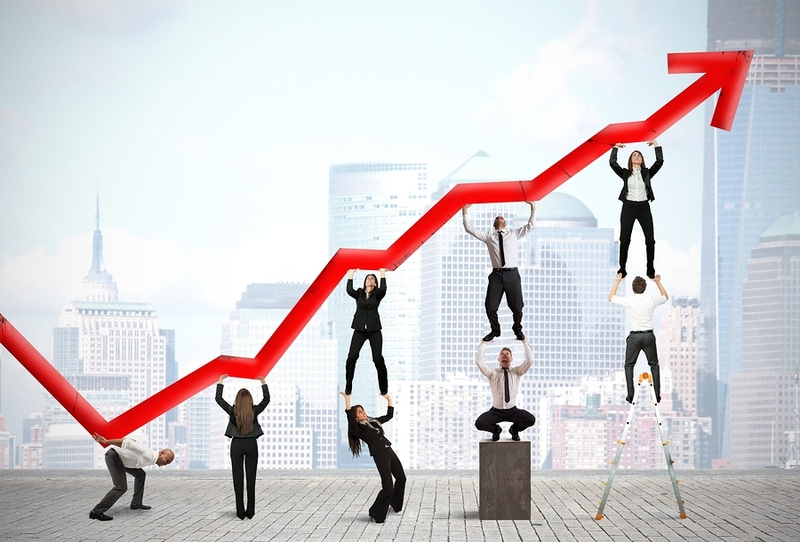 Facebook generated $12.47 billion in sales in 2014 (a rise of 58% year on year). Photo uploads are 300 million per day. Users spend 21 minutes per day on average on Facebook. 31% of US senior citizens are on Facebook. 66% of all millennials (15-34 year olds) use Facebook. People spend 927 million hours a month playing Facebook games. There are 1 billion mobile app links enabled on Facebook. How are you using Facebook? Are you using contests? Look forward to hearing your stories and insights in the comments below.